At Seaspec Marine Services we’re proud of our reputation for industry excellence. As part of our commitment to upholding this reputation, all our work is carried out in strict compliance with industry expectations, operating under the standards outlined by the ISO frameworks, which ensures quality, health & saftey and environmental management systems are upheld in every area of our business, encompassing our facilities, people, training, services, and equipment. 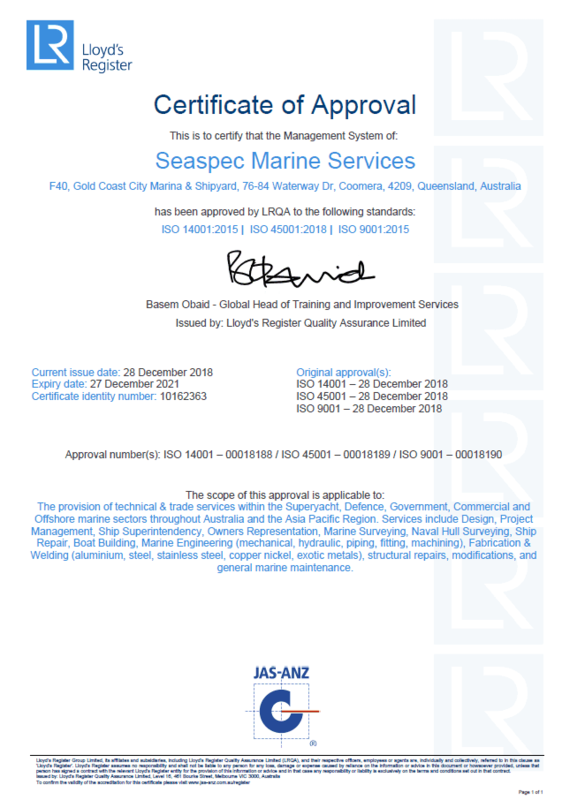 We confidently guarantee all our work and take a procedure-driven approach to our project management to ensure we remain compliant with and adhere to the industry regulations and obligations of the National Standards for Commercial Vessels (NSCV), as implemented by the Australian Maritime Safety Authority (AMSA), responsible for the safety of vessels and seafarers who operate in the domestic commercial industry. Seaspec Marine Service are proud members of the Australasian Institute of Marine Surveyors (AIMS) and the Welding Technology Institute of Australia (WTIA), and our team regularly undertake ongoing training and professional development to ensure they remain abreast of industry trends and changes, as well as skills-development opportunities and new technological innovations. Each member of Seaspec Marine Service’s trade team holds the necessary trade qualifications backed by a combination of experience and professionalism. With a minimum trade level of Certificate III Engineering, many of our employees are Diploma-level engineers across multiple trades, and have cross-trained in other marine-related disciplines to bring a combination of skill and versatility to our full suite of marine services. Our clients expect and deserve the best from us – whether it’s our service, our workmanship, our facilities, or our after care. By committing to industry standards and regulations, and continuing to strive for excellence within our own professional practices, we’re confident we can meet your expectations every time.